Hi there! I’m so excited to share a review for a new contemporary romance from bestselling author Laura Kaye. 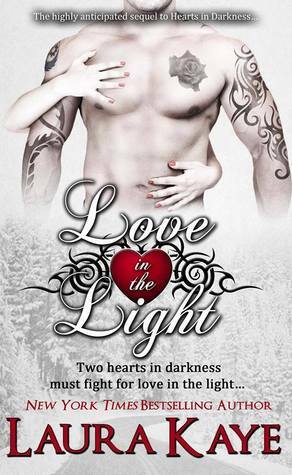 LOVE IN THE LIGHT is the long-awaited sequel to HEARTS IN DARKNESS, a novel of two people finding love in a tight situation: trapped in an elevator during a power outage. I just adored Makenna and Caden and was so glad to have an HEA for them once the rescue was long past. This sequel, however, deals with the darkness that creeps in when we least expect it: depression, and PTSD, and finding a way back to the light of love. It was really touching for me, a depression survivor. Catch my review below and be sure to enter to win one of three totes filled with book swag. This is the second book in a series, and can be read as a standalone, but best enjoyed after reading HEARTS IN DARKNESS. So, Makenna and Caden met two months ago when they were trapped in an elevator for hours. Caden is a paramedic; he chose this profession because his family was in a horrific wreck when he was fourteen, and he was trapped for hours upside-down in a drainage ditch with no assistance. His father was unconscious and his mother and younger brother were killed. His family shattered that night, with his father living a half-life that had no love or affection for anyone, not even Caden. Caden still suffers PTSD and claustrophobia as a result of the wreck, but he’s a damn good paramedic, and thrives on his level-head while assisting people in emergencies. While trapped in the elevator Makenna helps Caden with his clautrophobia-induced panic attack. They bonded over them each losing their mothers when young–Makenna’s mom died when she was a toddler. Fast forward to Thanksgiving. And LOVE IN THE LIGHT. Caden hasn’t had a family holiday since the car wreck. He usually works overtime at the firehouse so guys with families can have the holiday off, but Makenna’s family wants to meet him, so they drive to Philly. There, Caden has to face the gauntlet of Makenna’s three brothers and father. He actually holds his own, despite his anxiety, and is even able to tolerate the appearance of Cameron–bestie of Makenna’s brother Ian and also Makenna’s former serious boyfriend–former fiance, truth be made clear. And Cameron’s sure he wants Makenna in his life. This book is told from both Caden and Makenna’s POV, so we get to experience the highest of highs and lowest of lows. And boy howdy, does it get dark. Caden’s been asymptomatic for PTSD for a while, but he finally has someone real in his life–Makenna–to lose. And Cameron, successful, attractive doctor, is certainly better-suited to giving his beloved Makenna a far better life than Caden can. Right? Enter depression and complete freak out and Makenna having her own sincere challenges–that include a pushy Cameron, medical issues, and an unshakable love for Caden. This is a romance that started with an HEA, got mired in the depths of depression, and worked hard to find the light of love. And succeeded. As a depression survivor, the descent into darkness that Caden experiences is eerily reminiscent of my own personal history. The love that Makenna has, and Caden has for that matter, are really intense. Life is not easy, as they both learn, and–what may be more relevant: life doesn’t wait for you to get your act together. So many good parts of the book that touched off memories for me–big family, lots of nosy siblings, ulterior motives, and the helplessness/hopelessness of depression. The end is a bit of a thrill ride, with Caden facing his worst fears and coming out on the side with joy he never dared to dream. While Makenna tells a lot of this story, I really felt that Caden’s journey was more compelling. Mostly because she’s being excellent and supportive and dealing while Caden is a complete wreck inside and out that must get fixed right this time. I wonder if we’ll hear more of their love story, but even if we don’t…I’m sure they make it. Click this Rafflecopter giveaway link for your chance to win one of three totes filled with book swag. Don’t forget to pick up HEARTS IN DARKNESS–Currently on sale for $.99! Makenna James thinks her day can’t get any worse, until she finds herself stranded in a pitch-black elevator with a complete stranger. Distracted by a phone call, the pin-striped accountant catches only a glimpse of a dragon tattoo on his hand before the lights go out. Caden Grayson is amused when a harried redhead dashes into his elevator fumbling her bags and cell phone. His amusement turns to panic when the power fails. Despite his piercings, tats, and vicious scar, he’s terrified of the dark and confined spaces. Now, he’s trapped in his own worst nightmare. To fight fear, they must reach out and open up. With no preconceived notions based on looks to hold them back, they discover just how much they have in common. In the warming darkness, attraction grows and sparks fly, but will they feel the same when the lights come back on? You can catch up with Laura online on her website, Facebook, Twitter, and Newsletter SignUp.